2 weeks and 2 days off school Edward and Oren got this Easter. That is a long time off school. Throw in a weekend filled with chocolate shenanigans and the Grandparents visiting and it felt like even longer! 3 times last week I never made it to pudding, I fell asleep right after my dinner. Which is more than can be said for Mark who fell asleep during his dinner once! The mornings were great fun, especially if I got them out of the house or we did an activity. Lunchtime success was solely based round whether or not we managed a well timed Loki nap, although sometimes he completely missed lunch! Afternoons were tricky but we got through them. 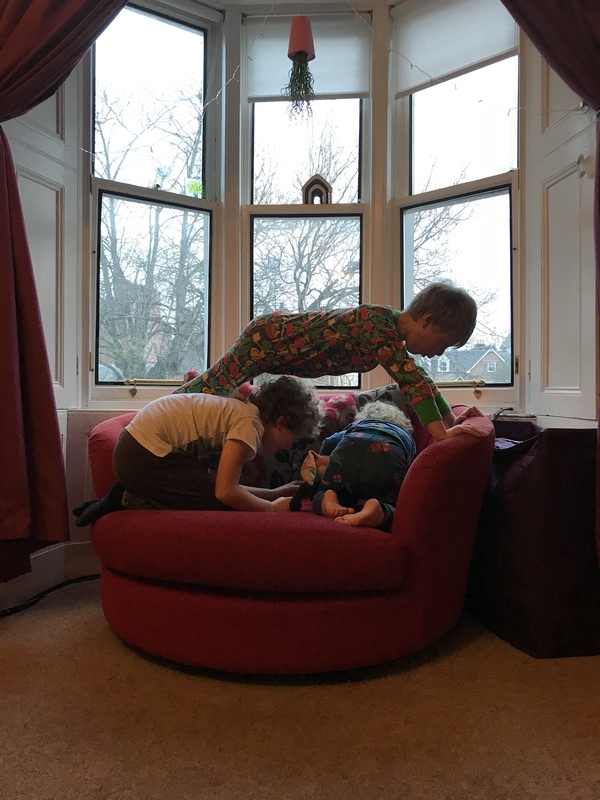 The witching hour however – that godless time of day from 5-7pm – when you realise your children might actually be feral and every word you say either falls on deaf ears or literally has 3 small humans hanging off it stealing your breath. Genuinely don’t know which one I prefer here. Also, what is Waffle Dog? I mean who is it aimed at, when did it happen and why are all my children obsessed with it?! We haven’t watched CBeebies since Oren was 2 and I thought a bit of guilt free TV time would be a good quiet, wind-down 10 minutes for Loki but no… it’s not Tom Hardy’s storytelling or the Octonauts that works for him, it’s a talking dog and his owner’s truly dreadful singing that I got my ears assaulted with daily last week. I think we’ll stick with Netflix and try and block Waffle dog from my memory! Pinterest was my friend here. Things to do with kids is something I won’t be stopping searching anytime soon. Quick activities have been the best as they don’t take long but can set up a nice theme for the day. Instagram challenges have been great too and we’re still very much obsessed with doing a daily mandala! I’ve rotated the books daily around the room so I don’t get driven demented by reading the same story to Loki 18 times in a row and done “invitations to play” (or more accurately “destroy”) for after naps. This holiday, unlike Christmas I’ve really noticed the 3 of them playing together. There is a proper bond now between the 3 of them. They all look out for each other and beneath the usual sibling squabbles and fights there is genuine affection. It was lovely to see. The wobbel 360 has been great as we’ve all sat round it on the floor and played games, rotated it to the next player and it’s big enough for us all to use as a proper play space. The curve on it has proved a challenge in stacking constructions too – it’s caused quite the hissy fit from Edward more than once! Now spring is most definitely on the way we can focus on our garden. It was destroyed when our town flooded 3 years ago and we’re only just catching up with repairs but we’re all loving being outside again. We’ve even got flowers which is a first! Hope you all had a lovely Easter break too! It’s a looong time for them to be off. I agree that the Pinterest use cranks up several notches on the run-up to and during school holidays!